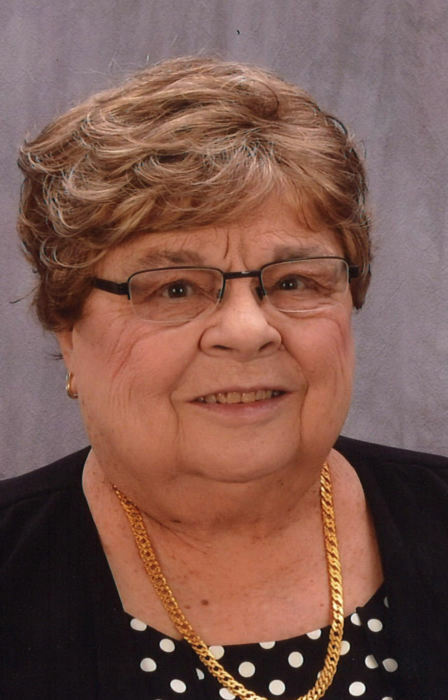 Callista M. Decker, 83 of Dubuque, Iowa passed away suddenly on April 7, 2019 at home. Mass of Christian Burial will be at 10:30 a.m. Thursday, April 11th, 2019 at St. Joseph Catholic Church, Key West with Rev. Rodney Allers officiating. Burial will follow in Mount Olivet Cemetery. Visitation will be from 3:00 p.m. to 8:00 p.m. Wednesday, April 10th, 2019 at Leonard Funeral Home & Crematory, 2595 Rockdale Road where a wake service will be at 3:00 p.m.
Callista was born on April 24th, 1935 in Dubuque, Iowa, the daughter of Arthur and Marcella (Maro) Tigges. She attended St. Catherine’s School and on May 25, 1954 she married Albert Decker at St. Catherine’s Catholic Church. Albert preceded her in death on January 8th, 2019. She was a wonderful wife, mother, grandmother and great grandmother. She was a member of St. Joseph Key West Rosary Society and also belonged to the Mother Cabrini, C.M.S.C. Callista enjoyed her life on the farm and being a homemaker. She was known as the egg lady. She was a wonderful baker and cook, she would never let you leave hungry. Callista made many birthday and wedding cakes for family and friends. Albert would offer cooking advice and she would remind him that she didn’t tell him how to farm. Callista also loved to sew, making many stuffed animals and crafts that her grandchildren and great grandchildren are still enjoying. She enjoyed to read and her flowers along with spending time with her family during the holiday’s especially Christmas leaving many wonderful memories. She will be deeply missed. Callista is survived by her children, Dale (Ann) Decker, of Key West, Ron (Bitzie) Decker and Jean Decker of Dubuque, and Gary (Lisa) Decker, of Robins, IA. Grandchildren, Tammi (Bob) Schroeder, Matt (Teeney) Decker, McKenzie (Tim Davis) Decker, Dena (Travis) Voss, Laura (Zach) Hodge, Brian (Amy) Decker, Jason Decker, Katie (Drew) Simpson, Elana (Coby Clapp) Decker, Sirena (Sam) Stark. Granddaughter-in-law Stephani Decker. Great grandchildren, Evan, Holli, Jacob, Alexis, Morgan, Peyton, DJ, Calli, Cate, Parker, Oli, Eben, Avery, Maddy, Gwen, Gus, Cooper, and Camille, and her 19th great grandchild is expected to arrive in June. She is also survived by her brother Ray Tigges; brothers and sisters-in-law, , Vincent (Evelyn) Decker, of Zwingle, Hubert (Elizabeth) Decker, of Cascade, Monica (Cletus) Thielen, of Zwingle, Darlene Collins, of Dubuque, John “JJ” (Erma) Decker of Dubuque, Louis (Darla) Decker, of Dubuque, Melita (Virgil) Hansen, of Maquoketa, Agnes “Fran” Decker, of Dubuque, Bernadine (Mark) Giese, of Dubuque, Kenneth Decker, of Dubuque, and Charlene Decker of Dubuque. She was preceded in death by her parents; her husband Albert; father and mother-in-law John and Frances Decker; her sister Mary in infancy; a son David J. Decker; grandson Timothy R. Decker; sister-in-law Rosie Tigges; brothers and sisters-in-law William “Willie” (Mary) Decker, Raymond (Phyllis) Decker, Harvey Decker and James Collins. In lieu of flowers a Callista Decker memorial fund will be established. The family wishes to thank Key West Fire and EMS; Dubuque County Sherriff Dept. ; and Fr. Rod Allers for all their help and compassion that was given to them. Also, to Dr. Brian Sullivan, Dr. David Ringold, Dr. Scott Brock and Julie Ehlinger for all their care and compassion that was given to mom over the years.